The HR Payroll module within SapphireOne Payroll business software is a powerful tool which allows for the normal pay period data entry processes. Payroll/HR allows the set-up of standing or permanent arrangements for your employee’s pay. Entries here include standard working details, hours worked, and RDOs etc. Amounts relating to allowances and deductions are also entered and maintained here. Any changes in this Standing Transactions Inquiry will be used by the system, for all following Pay Runs. Start New Pay uses the current company and employee file details including hours, allowances and deductions from standing transactions, transferring them to a new pay run which is Working Transactions area. Working Transactions is the pay run working file. SapphireOne HR Payroll provides the option of using working transactions or working transactions Wizard. Both screens allow the user to enter the employee’s pay details specific to the current pay period. Adjustments may also be entered here including leave details, overtime, etc. The Working transactions Wizard is specifically designed to manage large numbers of employees, enabling speedy data entry. One of the more important aspects in HR Payroll is the pay run. SapphireOne pay run processes the working transactions so they may be used for reporting purposes such as payslips and banking reports. This process also includes finalising the PAYG calculations for employees and updates the accounting totals prior to transfer to SapphireOne Financials. The information is then transferred to history and can be viewed, at any time in the future. 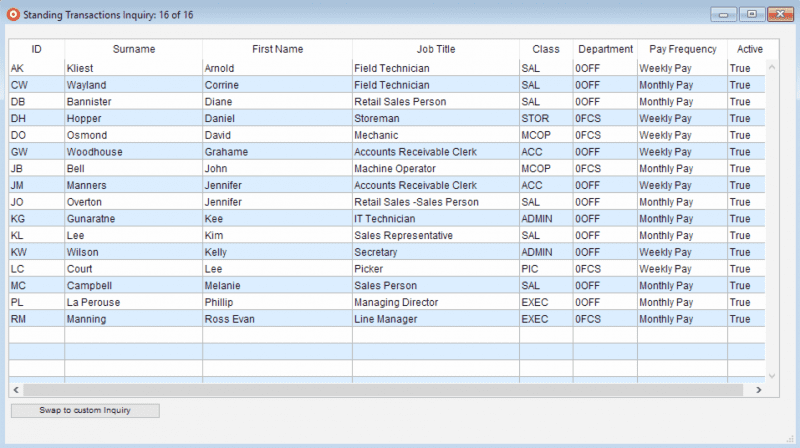 End-of-month is used to gather monthly total figures for your Payroll/HR reports. End-of-year is performed after the payment summaries have been processed and distributed. This is used to total all figures for the year and then to clear the totals to date for the next year’s figures. Both end-of-month and end-of-year have a checklist of items that are to be undertaken before SapphireOne allows processing. This method ensures that the user is certain that all reports are printed and that a backup has been performed before continuing. This function displays a window that shows Superannuation payments that are currently owing to employees. You have the option of displaying these payments by Superannuation Fund, Employee or by Pay Run. You also have to option of selecting what amounts are to be paid and the processed from this window as well. Selecting process will cause SapphireOne to automatically generate the Vendor Payments (VP) in Accounts mode. Alternatively, you may still go to Accounts mode and make your payments in the normal way. This will display a prepared check list enabling each step in a Pay Run to be completed then ticked off on a list. The list as ticked will then remain until the Reset Wizard function is accessed. 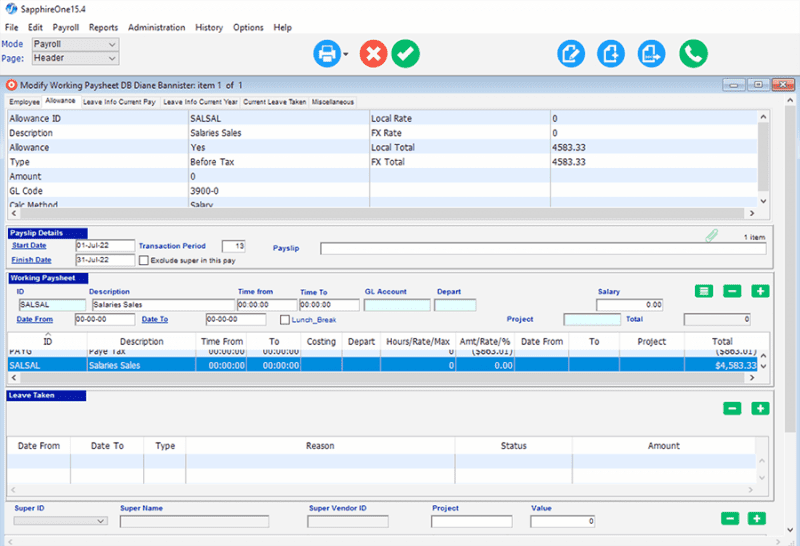 Working Transactions Wizard allows you to make Current Pay Run adjustments. The benefit of this is that, rather than making adjustments to one Employee from the Working Transactions Inquiry listing, you are able to Modify information for all Employees at once. Accountants & financial controllers all have their personal preferences. However, SapphireOne is a RocketShip because of its excellent reporting!